After last WCG I was fired up to redo the numbers for map concede and map select for a size 5 map pool. The results were a little intriguing. 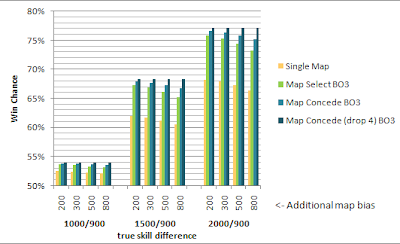 As the size of the skill difference between the players increase, the starker the difference in the different map selection methods. 4 map concede continues to remain at the same level regardless of additional map bias as it continually selects the middle ground where there is minimal bias. 2 map concede BO3 performs the next best with an additional bonus of map variety. Map select BO3 with random 3rd is another step below with only .4% difference in methods over a 10% map spread at 53% win chance for player 1. This difference in methods extends to 4% difference when player 1 should win 70% of the time and map spread is up to 20%. Single map random selection gets hammered quite severely, but more to do with the lack of 3 matches as it is more or less in sync with the true skill if you look purely at the average. The spread blows it out of the water though, giving 10% to 20% change in outcome depending on the map. Comparing this to other differences, it seems vitally important to not use random method when using 1 map. Map concede would keep the spread to whatever bias the middle map provides. Finally some stats and figures to get my own head around the problem and to show the powers that be.